Whew, I am tired. We did special election night coverage last night and I was at the station until midnight, then I was so amped I couldn't go to sleep so I stayed up til about 2am. Totally dragging today. But we had a great show with lots of local politicos calling in. To celebrate, a bento made quickly with leftovers and a few stars in honor of a fun election day. 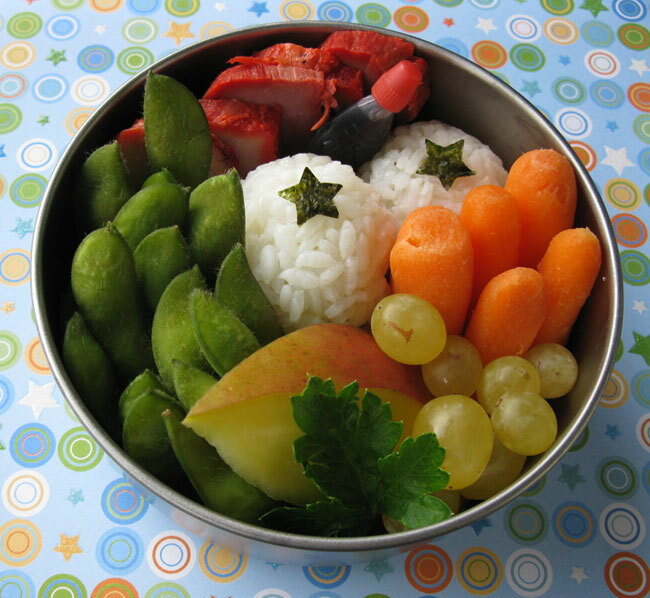 In this bento: bbq pork from G&G Supermarket, a fish container of soy sauce, rice balls with nori stars, steamed edamame, a slice of mango, a piece of parsley from Quivira Winery, grapes from De'Santis, and baby carrots. I love magic round bentos! This bento also celebrates my win in the Food Ninja contest at lafujimama.com. It was SO MUCH FUN to put together a Food Ninja video, and I am thrilled to say that my video won in the video category. My prize: 10 Inch ManPan Saute Pan (4.5 pound) by igourmet.com ! Woohoo! Also congrats to Sheri of Happy Little Bento for winning in the photo category. Thank you to everyone who voted for us. You ROCK! This bento is also included in Shannon's What's For Lunch Wednesday blog. Check it out for great lunch ideas. We sure rocked the vote alright! Pretty exciting results. I always reach for the MRB on those days too. Never fails; your bento looks as fresh and delish as on every day. Congrats on your food ninja win! It was very cool to see bento represent! Every time I read "ManPan" I kinda giggle. Don't ask me why. But I can't wait to find out what it's all about! ManPan. Woo! Yes, Lia, it is char siu pork. I't rather inexpensive at my local grocery store and I can chop it up into whatever size pieces I want. Thanks for your support and I can't wait to get my pan! Yummy bento! You can do so much with char siu pork! One especially is fried rice and of course char siu bao (bun)! I remember having char siu spaghetti noodles with broth at a local chinese restuarant in Hong Kong when I was young....that was interesting! Awesome suggestions, Mrs. P! I need to use it more often. :) Now I am totally hungry for pork bun. Ha ha dragonmamma! I think it's for hitting men in the head with.